To learn more about American Outback Buildings. NOW IT'S TIME TO BUILD GREEN! EACH PIECE IS COMPUTER-CUT FOR EXACT FIT & LITTLE WASTE. Installation is available for an extra charge in most states, but we specialize in manufacturing them into an easy-to-build kit. ALL BRAND NEW MATERIAL IN ALL OUR KITS. This building includes roof and wall insulation that's enough for most parts of the country as a shop, but you may be required to add more on your own for residential living. 2 - 8' wide x 7' high garage door frames and trim (or window frames). 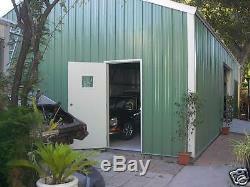 We can make the building with one or two garage door frames. Height is perfect for a cathedral ceiling!! Also includes a 3 ft wide x 6'8 entrance door frame with trim. Choose your door locally and we'll adjust the header to fit. The first photo shows a one foot shorter building than the actual size and the other photos show a little larger building with a slightly higher pitch. This building has not been made yet, as you need to select the colors of the roof and walls. 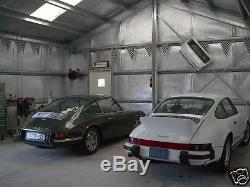 The completed inside photo shown is from a 24 ft wide garage with 10 ft sides and a higher peak. Your building will be built to your color specifications for roof, walls, and trim. Another photo shows how you can finish your ceiling cathedral style for the open feel. The roofing is 26 gauge pre-painted steel classic rib panels with 26 gauge vertical classic rib used for the walls, too. Many "Energy Star" colors available at no extra charge. Engineered for your building codes, but higher codes may need a heavier frame. Call our office if you're not sure and for more details. Building Type: Garage 800 Sq Ft. 20' with a 4 ft wide x 20' long porch. 10 ft, 10 1/2 inches. 20lb roof live load, 110 mph wind, 2015 IBC code book, exposure B. One layer of insulation for roof and walls!! All galvanized steel framing of 16-12 gauge (not just 20-22 gauge as others use) - columns, rafters, purlins, girts. Insulated Roof and Insulated walls, but colder climates may need to add additional insulation on the inside. Two 8' wide x 7' high garage door frames and trim (We can provide a window frame instead of either garage door frame if you want). One 3' wide entrance door frame. Can be engineered and installed on gable end or back side of building. All long-life (60 year) fasteners (better than stainless steel) - bolts, brackets, colored screws (no nails), socket for colored screws. All matching sealing strips to keep everything out, like mice and bugs. All galvanized and pre-painted flashings, trim, ridge caps, and channel to keep rain out. All steel anchor bolts along with the drill bit needed to drill into your DRY cement. 2 sets of custom and wet-stamped engineered plans for any state, including foundation drawings. No one else provides your custom foundation plans. No need to hire an engineer to stamp the concrete plans when we provide it in all 50 states. Detailed instruction manual and video instructions included. We do not use a tubular steel or 2-4 lightweight steel framing members in any of our buildings!! Our framing pieces are at least 6", up to a 14" size with higher building codes. For East and West Coast. The building will be delivered to your site for FREE. All framing parts are cut and punched as per the plans, ready to be bolted together. The girts and purlins are delivered in the correct sizes and use self-tapping tek screws. The roof and wall sheeting is also cut to size, with minimal trimming needed. No specialty tools are needed. We don't make it our business to sell the instructions. Our multi-faceted manuals explain every possible detail, even what simple tools you'll need before you get started. While you construct your building, you can call our customer service if you have any questions. 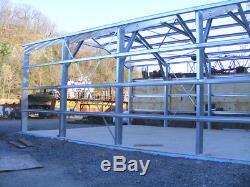 ALL GALVANIZED steel construction, not just the purlins and girts, but the whole frame is galvanized steel!! NO I-beams with red oxide primer that needs to be painted forever. You NEVER need to paint any part of our buildings. You don't need to do any welding. You don't need cranes. No Trusses - more available interior space - stronger construction - much higher snow/wind loads. No Interior columns - most buildings, more un-obstructed interior space 4. Our roof fasteners are patented - eliminate roof leaks - better and stronger than stainless steel. No rotting wood in or on the ground, no termites, no painting. All steel and insulation made in America-100% 7. All buildings supplied with wet stamped engineered plans for your building and your foundation! You don't need to hire another engineer or architect for any interior walls. Place inside walls anywhere you want them with steel or wood studs. All buildings supplied with a detailed assembly manual and various instructional videos - don't pay others for instructions. We can deliver fast - we are not affected by any steel shortage. Highest fireproof ratings in the steel building industry. We are Better Business Bureau members. Our kits do not include the concrete for the footings and/or slabs, or the erection of the building. Our steel building technology began in Australia where galvanized steel construction is most common, even for homes. Now it's available here in the U. With all American made materials, and designed and engineered by Americans. The item "STEEL INSULATED HOUSE with PORCH -METAL BUILDING Shop KIT with or without garage" is in sale since Saturday, January 12, 2019. This item is in the category "Business & Industrial\Building Materials & Supplies\Modular & Pre-Fabricated Buildings". The seller is "americanoutbackbuildings-sgl" and is located in Lancaster, PA. This item can be shipped to United States. Custom Wet-Stamped Engineering: Including Delivery Insurance !